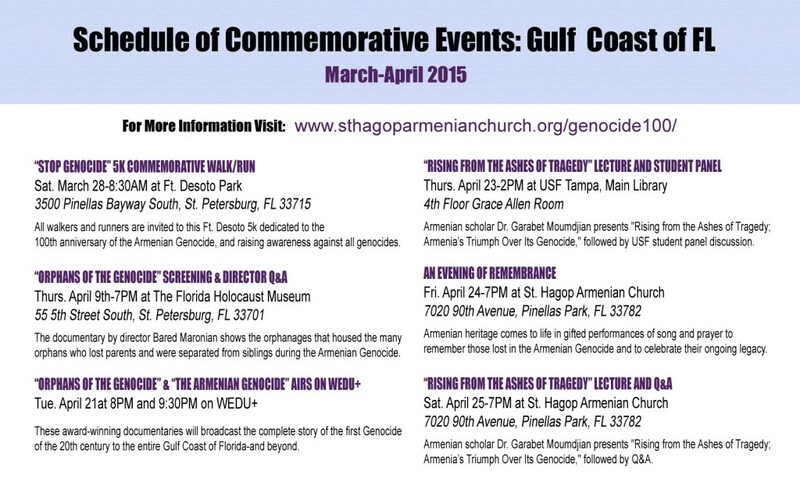 PINELLAS PARK, FL – On Friday, April 24, 2015, Gulf Coast Armenians centered in Tampa/St. Petersburg will join Armenians around the world in solemnly commemorating the Armenian Genocide. Beginning in 1915, the Ottoman Turkish government launched a premeditated campaign of genocide against their Armenian citizens. Approximately 1.5 million Armenians—75% of the Armenian population of the Ottoman Empire—were killed. This was the first modern example of genocide in the 20th century. Indeed, the very word genocide (denoting the destruction of an entire people) was originally coined in 1944 to describe the policy of systematic extermination used by the Young Turks regime against the Armenian people, and that the Nazis subsequently waged on European Jews. All walkers and runners are invited to participate in Tampa’s first-ever 5K dedicated to the Armenian Genocide and towards raising awareness about all genocides. Interested participants can register on Active.com. Guests can also connect with other runners on the Stop Genocide 5K Facebook event page. Hear from South Florida film director Bared Maronian as he presents his documentary on the orphanages that housed the many orphans who lost parents and were separated from siblings during the Armenian Genocide. Orphans of the Genocide is a documentary by South Florida film director Bared Maronian showing the orphanages that housed thousands of orphans who lost their parents and were separated from siblings during the Armenian Genocide. Film starts at 8:00 PM (90 minutes). The Armenian Genocide is the complete story of the first Genocide of the 20th century. It features interviews with Pulitzer Prize-winning author Samantha Power, and best-selling author Peter Balakian, and contains historical footage of the events. Narrated by Julianna Margulies, it also includes narrations by Ed Harris, Natalie Portman and Laura Linney, among others. Film starts at 9:30PM (60 minutes). The USF Libraries Holocaust and Genocide Studies Center host Armenian scholar Dr. Garabet Moumdjian for a presentation entitled “Rising from the Ashes of Tragedy – Armenia’s Triumph Over Its Genocide.” A panel discussion by USF students will follow the presentation. Armenian heritage comes to life in gifted performances of song and prayer to remember those lost in the Armenian Genocide and to celebrate their ongoing legacy. Armenian scholar Dr. Garabet Moumdjian presents “Rising from the Ashes of Tragedy – Armenia’s Triumph Over Its Genocide,” followed by Q&A. 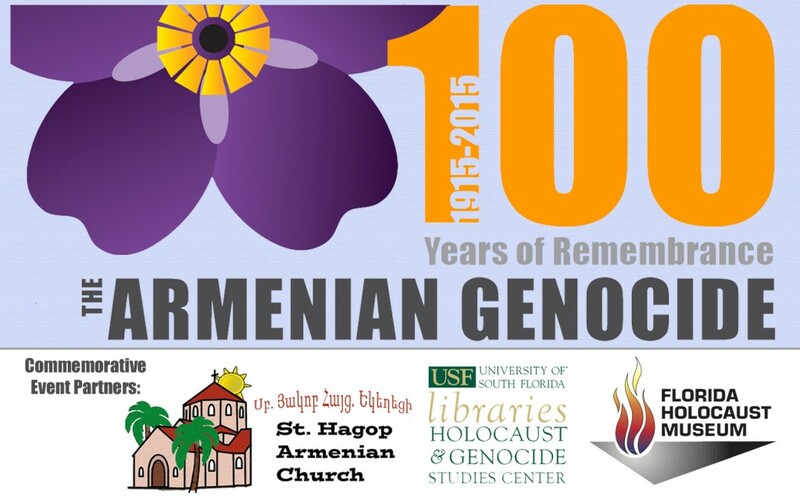 For a full listing of Armenian Genocide 100th anniversary commemorative events in Florida, please visit our Florida Armenians 2015 Page. COCONUT CREEK, Fla. — For many years now, writer, director and producer Bared Maronian has used his talents in a variety of outlets, especially in Florida public television. However, in the past few years, he has decided to bring his skills in putting together documentaries to a subject close to his heart, the Armenian Genocide. Maronian emigrated from Lebanon during that country’s civil war. He was always interested in the arts — folk dance, music, and theater — and with film, he was able to unite all the subjects that interested him, especially as they concerned his heritage. After graduating from Haigazian University in Beirut and working for a time as a photojournalist, he found his way to the US. “When I came here, it was hard for me. Eventually I went to the Broadcast Career Institute in Florida,” he said. Not long after that, he landed a job at the local PBS station. He was with PBS for 21 years. When he started, he recalled, he worked on local programs, working his way up to regional and national programs. He also worked on the Nightly Business Report and did post-production on various programs, including in the Spanish language. Slowly, he realized that what appealed to him most was making documentaries and telling a story from start to finish. Maronian said that he worked on some short documentaries, anywhere from 10 to 15 minutes, on Armenian subjects and showed them in local settings and some community gatherings. “People approached me and said I should expand them,” he recalled. “For the last five years, I’ve been doing that. The most serious one is ‘Orphans of the Genocide,’” which was released last year. He works on the Armenian-themed productions such as “Orphans of the Genocide” with the independent Armenoid Team, a subsidiary of Armenoid Productions. Among the other shorts he has done on Armenian subjects are “Komitas Hayrig,” selected by ARP Film Festival in Hollywood and “Wall of the Genocide,” winner of a Telly Award in Historical Communicator category and screened in the Myrtle Beach International Film Festival and ARPA. Maronian said that the starting point for “Orphans” was a particularly disturbing column by British journalist Robert Fisk on an Armenian orphanage in Antoura, Lebanon, which once housed 1,000 orphans who were forced by punishment to lose their heritage. He worked on the film for more than three years and eventually it was broadcast on four PBS stations, invited by various communities, universities and clubs for viewing both in the US and around the world, and finally it was shown at various film festivals, including the Apricot Film Festival in Yerevan, Socially Rated Film Festival in New York, Toronto’s Pomegranate Film Festival and the Cannes Film Festival’s documentary division. In addition, it will be shown at the 2015 Geneva International Film Festival and Forum on Human Rights. “They are very interested in making ‘Orphans of the Genocide’ part of the 2015 festival. It is the most important step that the film could take,” Maronian said proudly. Now, Maronian is focusing on the women who were either victimized during the Genocide but also many American and European women who came to the rescue of the Genocide victims. Work on “Women of 1915” is “going very well,” Maronian said. Maronian is in the process of fundraising to complete it. “I am very hopeful that we will realize our financial needs,” he said. “Our initial goal was to finish the film by April 2015, but I did not think that was a realistic deadline. I did not want to jeopardize the quality,” he said. The film will be finished in 1915, but possibly closer to the fall. “We are filming and still doing some research. It is in the second phase, where we have lined up some interviews with people whose families have experienced the Genocide,” he added. The film, he explained, would be about “the plight of the Armenian women and all the non-Armenian women who came to the rescue of their sisters. Girls who were 19, 20, 21 left their plush homes in Scandinavia, the US or Canada and volunteered to travel to Western Armenia and the killing fields of the Genocide and met their Armenian sisters,” he said. Among the women who will be featured will be writer and activist Zabel Yessayan, Danish humanitarian Karen Yeppe and American Red Cross founder Clara Barton. As many know, he explained, the “men were taken care of” by the authorities and killing separately, leaving the women, children and elderly at the mercy of the killers. Another aspect of the film will be dedicated to Islamized or hidden Armenians. “Turkish women on their death beds would confess that they were Armenian,” Maronian said. Now he said, the topic is being more and more exposed. “The ultimate goal of what I am doing is that we need to produce film on the Armenian Genocide and spread awareness of the Genocide and ultimately, hopefully, by educational entertainment, to put an end to genocide,” Maronian said. This article originally appeared in the Armenian Mirror-Spectator. It is republished with the expressed written consent of the author.